LOS ANGELES — First-grader Lena Barrett clicks through a series of icons and logs onto a laptop under the fluorescent lights of her classroom. Before long, a cartoon version of a game-show announcer appears. Six-year-old Lena was among 116 kindergartners last year who participated in an experiment at her school with a teaching method called “blended learning,” where students learn from computers as well as teachers. She attends the KIPP (Knowledge is Power Program) Empower School, which opened last year to serve minority and low-income students in a tough South L.A. neighborhood. Results from the trial year were so promising that school administrators are continuing the use of computers in kindergarten classrooms this year, and they expect computer use to expand throughout the KIPP charter-school network of 109 schools in 20 states and the District of Columbia. “The early indications are that this is replicable in future kindergarten classrooms and, as we grow, into higher grades,” says Richard Barth, chief executive of the KIPP Foundation, which supports the KIPP model of extended school days, a longer school year and frequent standardized tests to measure progress. 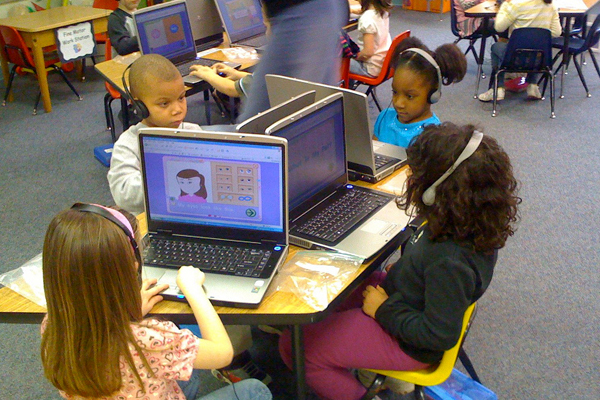 Computer instruction in kindergarten classrooms can be controversial. It is occasionally used by some teachers as a supplement, but it’s rarely used every day to substitute for traditional teacher instruction of the littlest learners. Still, KIPP Empower is among a growing number of schools that are embracing technology-infused approaches to teaching and learning. Rocketship Education, another national network of charter schools, is putting its kindergarteners in front of computers, too. The kindergarten experiment at KIPP Empower comes as some schools and districts in California, Arizona, Virginia and elsewhere are experimenting with computer-based learning in the elementary grades. Advocates of blended learning say it holds the promise of offering engaging, individualized computer instruction that allows children to move at their own pace. And, at a time when school budgets are being slashed nationwide, the new model at KIPP could help educators manage larger classes. At KIPP Empower, principal Mike Kerr devised a complicated school-wide rotation where children are on laptops inside their classrooms twice a day for roughly half an hour each time. He says the computers allow him to preserve the small-group instruction that he considers critical to student success. As a result, students who started the year behind their peers graduated from kindergarten on track. Kerr says the blended approach led 95 percent of his kindergarteners to score at or above the national average in math after the first year, while 96 percent scored at or above it in reading. The test, Measures of Academic Progress, was developed by the Northwest Evaluation Association. More than half of Kerr’s students scored in the nation’s top quartile, or top 25 percent, in both subjects. Kerr said the first-year test results were especially heartening because his students—94 percent of whom qualify for free or reduced-price lunch based on their family incomes—did not start out the year in a strong position. Only nine percent arrived in kindergarten ready, according to the STEP (Strategic Teaching and Evaluation of Progress) pre-reading test, developed for high-risk children by the University of Chicago. Want more information on blended learning? Innosight Institute has profiled more than 40 different schools that are blending online learning with traditional classroom teaching. By the end of the year, 96 percent of kindergarteners reached or exceeded the proficient mark on the same STEP test, Kerr says. With just one year of data, however, it remains to be seen whether these results are evidence that the use of computers in the classroom can improve long-term student outcomes, especially at the early elementary-school level. In addition, some education experts are wary of putting kindergarteners in front of computers. 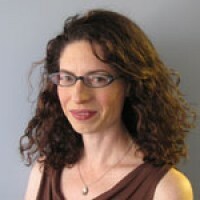 “Parents, teachers and educators are right to be concerned about time at the computer if it replaces essential learning experiences and activities,” says Chip Donohue, director of distance learning at the Erikson Institute in Chicago, a graduate school of education that specializes in early childhood development. Five-year-olds need “active, hands-on, engaging and empowering” activities, “not electronic worksheets and drill and practice,” Donohue says. On a recent visit to KIPP Empower, it was not clear that computers—or the educational games that the children play on them—were doing much teaching. Instead, Kerr says the computers provide a way to reduce his class size of 28 students. By having half work on laptops in the classroom, a teacher is able to work intensely with the other 14 students. The computers are more than just high-tech babysitters. Students are engaged in animated cartoon games that, for example, drill phonics and arithmetic. More importantly, the programs flag topics when a student is getting the answers wrong. Each day, KIPP’s technology instructional assistant, Elisabeth Flottman, collects data from the educational software on each student and gives the information to teachers. The software can report, for example, if a student has been struggling with beginning sounds, ending sounds or blending sounds. This can help the teacher zero-in on individual student needs. It also reports if a student sat idly at the computer for an extended period of time. “If I know that, I can pay a little more attention,” says Flottman, who circulates among the four kindergarten classrooms and helps students with computer crashes, headphone snags and log-on issues. 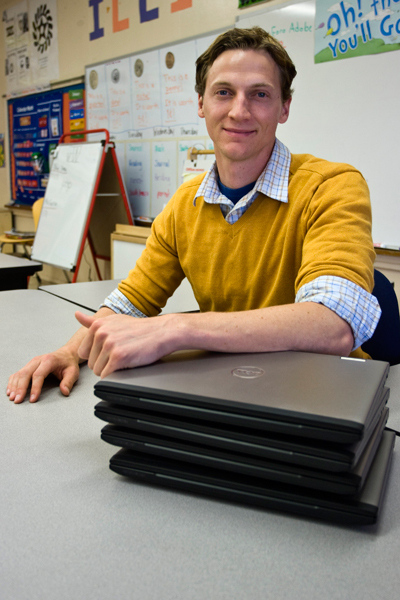 Principal Kerr says he’s “underwhelmed” by software offerings for five- and six-year-olds. “One of the biggest challenges was finding computer programs,” he says. Kerr pieced together an online curriculum from a variety of vendors. That required him to build an expensive interface from scratch so that students and teachers wouldn’t have to waste time logging onto each program. And they had to create pictorial log-ons so children who can’t spell their names can click on photographs of themselves and participate. Still, there were problems. The students exhausted one math program in March that was supposed to last the full year. Kerr, 34, is a self-professed technophobe who turned to computers to cope with California’s fiscal crisis, which led to teacher layoffs, increased class sizes and slashed school budgets. He first began to appreciate the power of small classes at the start of his teaching career with Teach For America in Harlem. Later, he helped found a charter school in the Crown Heights section of Brooklyn, where his students posted some of the highest test scores in New York. The donation allowed Kerr to rethink the school’s design; instead of five classrooms of 20 students, he would now have four classrooms of 28. He decided to hire one fewer lead teacher and take in more students. Kerry opted against a computer lab because he wanted kindergarteners to feel like they were in a warm environment, not sitting among rows of computers. Despite the encouraging early results, it’s hard to assess the success, in part due to considerable controversy over the validity of standardized tests at the kindergarten level. The state of California doesn’t even test its public-school children until the second grade, so there are no data for comparison. And because Kerr’s test results reflect only one year with this particular group of students, it’s unclear whether he can replicate the success. It’s also impossible to tell how students would have fared without any computers. Kerr had the luxury of handpicking and training his cadre of teachers, after all. Q&A with former Gov. Bob Wise: What will a ‘digital’ school look like in 5 years? Still, one other KIPP school in the L.A. area has already adopted parts of Kerr’s digital learning model for the current academic year. And two KIPP schools that are scheduled to open in the fall of 2012 are planning to do so as well.